I wrote this on the plane ride home from my Mom's funeral back in 2006. She was born Frances Stillman and she grew up in New York city, the granddaughter of Russian immigrants. Her parents worked in the garment industry. She went to the Dalton school in NYC. She once mentioned that when she was 17, and still in high school, she went to the homecoming game at Brown University and was voted homecoming queen even though she didn't go there. She went to the University of Michigan for a year before transferring to Sarah Lawrence where she studied religion and philosophy (one of her teachers there was Joseph Campbell). After graduation, she was accepted to the graduate program at the Harvard School of Theology but decided not to go. She had a younger sister, Marcia, whom she was very close to. They were 16 months apart in age. Marcia was an actress (a NY post critic called one of her performances "a revelation"...mom saved the clipping and showed it to me one day). Marcia was schizophrenic though. She died when she was in her early 20s. One Thanksgiving night she either jumped or fell out of their parents' high rise apartment while everyone was eating Thanksgiving dinner. That traumatic event shook up my Mom and helped inspire her to forge a unique path in her own life. Soon after Marcia's death, she married Bruce Davidson, a photographer. (Well, actually she was married one time before that but she said that was just a quickie thing done as a favor to a friend who needed a way to stay in the country.) She travelled through the south with Davidson in 1962 while he shot photos of the Civil Rights movement. During this trip, Davidson shot steel workers in Chicago, Ku Klux Klan cross burnings, migrant farm camps in South Carolina, cotton pickers in Georgia and protest marches in Alabama. They lived in Chicago for a while too. Eventually they got divorced. She didn't talk about this period of her life too often. After that, she lived in the Village and dove into the downtown NYC art scene. She hung out with some interesting people. She starred in an avant-garde film called "The Guns of the Trees" which featured Allen Ginsberg reading poetry and was directed by Jonas Mekas, the original film critic at the Village Voice. She plays a depressed, poetry-reciting type. She worked at the offices of filmmaker D.A. Pennebaker and knew other artists in the scene, including Andy Warhol. She never name-dropped though. Random, infrequent anecdotes were the only clues us kids ever got about her life before we came along. For example, I told her a few months back that I had gone to see the Robert Rauschenberg exhibit at the Met. She said, "Oh really? I used to babysit his kids." Another time there was a conversation about pot brownies. She mentioned that back in the day she threw a party and put some pot brownies out on the table without telling anyone what was inside. Ginsberg, a guest at the party, wound up yelling at her about how you can't give people drugs and not tell them. Chewed out by Allen Ginsberg for being too wild. That was my mom. In college, I got way into the Velvet Underground. She found that out and was surprised. She used to live next door to them. She told me that back then she was more into La Monte Young, the minimalist composer because he was doing stuff that was really out there. She thought Lou Reed was kind of a prick. But she did think John Cale was interesting. And actually, she knew the VU well because she dated Angus Maclise, the original drummer in the Velvets (he quit because he thought the band was "too commercial"). She and Maclise left NYC and hitchhiked from Yugoslavia to India in the mid-60s, spending time in Morocco, Spain, France, Turkey, Greece, Iraq, Iran, Pakistan and Afghanistan. I think that trip and those cultures really expanded her horizons and shaped her view of the world. I'm sure there were many adventures during that trip I never heard about. One she did mention: They stayed in a cave on an island in Greece for a couple weeks with Leonard Cohen and some other expats. She eventually returned to the US and split with Maclise. She then spent time travelling out west. She was in New Mexico for a while, in and around Santa Fe. She worked as a newspaper reporter for a bit there I think. She also spent time out in San Francisco hanging out with hippies/artists out there and appeared in some trippy art films made by artist Walter De Maria. She saw Janis Joplin play at the Fillmore West. Then she wound up in Oregon or somewhere working as a nanny. Her employers told her that maybe it was time for her to go home. So she did. She returned to New York City. She'd always had a difficult relationship with her mother, Eve Stillman. Eve was a feisty businesswoman. Eve rescued her husband's failing lingerie business, renamed it Eve Stillman, and came up with the horsehair petticoat, a fashion necessity of the 50s. Eve could be pretty abrasive. I don't think she really approved of my mom's lifestyle. Nonetheless, mom had had enough of life on the road and moved back in. Around this time Eve saw a story in Women's Wear Daily about a competitor. So she called up the paper and said, "Why don't you do a story about me?" So WWD sent out a reporter to interview her. That reporter was Ron, my dad. Eve met my dad and invited the handsome, single Israeli boy to come to her upcoming birthday party so he could meet her daughter. The description she used to lure him in? "She's got a job and she's in therapy." Romantic, eh? My dad bit and they met at the party and hit it off. The next date was a Ravi Shankar concert. Music was a key bond at first. They both dug the blues, Johnny Cash, and Bob Dylan and used to sit around listening to records. Since they were broke, they would sometimes go to night court for dates. Two months into the relationship my mom served my dad a batch of those pot brownies. Despite Ginsberg's warning, she didn't tell him what was in them. He ate six. A couple hours later he said, "We should get engaged." Mom took this as a proposal and said yes. 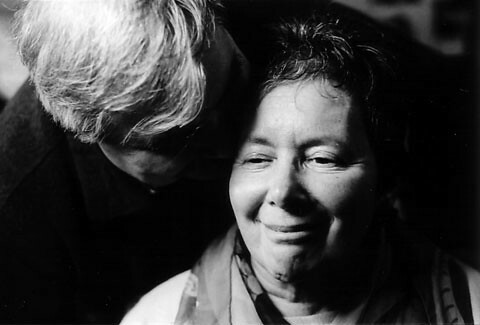 They got married two months later (in 1967) with ceremonies in New York and Israel. They lived in NYC and my sister, Tamara, was born. My dad went to law school, joined a law firm, and wound up working as an assistant DA in New York City (same office as Giuliani). I came along a few years later. They moved to the suburbs. Dobbs Ferry first. Then Irvington. She was a strange but cool mom. She meditated. She called herself Ziva. She fed us natural food (no soda, no sugar cereal, etc.). She conducted dream workshops. She wrote poetry. She sculpted stone and wood (pretty cool stuff too). She started "The Blue Door," a store that sold lingerie to suburban gals way before Victoria's Secret took off. She worked at the local public library. She was deep into spirituality and religion and things like Sufis, whirling dervishes, her Jewish heritage, etc. There was always interesting music in the house. Bob Dylan, Leonard Cohen, Janis Joplin, Stevie Nicks, Billie Holliday, etc. I didn't always get it at the time but those artists she loved seeped under my skin too. She always enjoyed New York City immensely too. She used to take us in to the city to go to museums, plays, or restaurants. And she loved to travel. We took trips to Austria, England, Israel, and the Caribbean. One time when I was in high school, I came home with a crew cut. She asked me why I was "so button-down." We always ate dinner together every night as a family, no tv allowed. Sounds simple but in retrospect I think that might be one of the most important things a family can do. And even though we hardly ever went to temple, every friday night we shared a special Sabbath dinner together. My mom and sister would say a prayer on the candles. My dad would bless the Challah bread and the wine. And then we'd eat. Usually, my mom would get a little bit tipsy. Things weren't always normal. For example: We had neighbors who had joined a cult. This cult forbade people from eating garlic. One day she was driving my sister and I somewhere and saw this cult leader's limo parked at the neighbor's place. She drove back to our place. Picked up some cloves of garlic. Then drove back and tied the garlic around the rear-view mirror of this guy's car. You know, to ward off the guy's evil spirits. And just to piss him off too I think. Probably because her mom was so overbearing, she always gave us lots of space. No curfews, no rules. It was tough to piss her off. Her way of raising kids was to plant seeds. She never told us what to do or how to think. I think her overbearing mom made her want to be the opposite. She conducted her weird life her own way, pointed us in the right direction, and hoped we'd figure things out on our own. Things took a turn in the mid 80s when she was diagnosed with multiple sclerosis. The disease slowly crippled her. First, it just slowed her. Then she needed a cane. Then a wheelchair. Then she and my dad moved out to Trinidad, California. The temperate climate helped her condition somewhat and the beautiful scenery (ocean/redwoods) lifted her spirits. But she continued to lose control of her body one limb after another. It was like watching someone slowly beat the crap out of her, one day at a time. But she never complained or felt sorry for herself. She said it just meant that her journey was becoming an inward one. She set up her room so the light could come to her. There was a beautiful view of the ocean. And there were gorgeous flowers planted outside on the deck. And bird feeders brought all kinds of jays and hummingbirds a few feet away. And next to her was her altar, full of photos of loved ones, talismans from her travels, art books, and more. She was a seeker and kept seeking even after her body betrayed her. She read philosophy, poetry, and other books voraciously. She loved William Blake, James Joyce, Rumi, Mark Strand, and countless other authors. She watched C-Span all the time. And she listened to Sufi, Persian, Indian, and other music from around the world. She had lots of friends and health-aides who were drawn to her spirit and vitality of mind. At the funeral, a few commented that they had learned more from her than anyone else. A couple even said that, except for one sister, they had never been as close to another woman in their entire lives as they had been to her. She had that kind of power. Her passing wasn't a surprise. She'd been ill for a while and it was getting worse. She knew the end was approaching. She was reading the Tibetan Book of Dying and other literature on "transitioning." She was scared of it but she was ready. I think she saw it as the final part of her journey. My dad was by her side when she passed away. She was a magical woman to be around. I'm sad she's gone but I'm happy her suffering is over. I feel incredibly lucky to have known her and to have her blood running through my veins.